Recap From the IFTD International Retailer Fly Fishing Show in Denver! 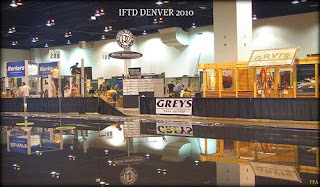 Another year brings another great Fly Fishing week at the IFTD "International Fly Fishing Trade Show" held in Denver once again. Impressive new products, feedback from some of the top players in the Industry as to what's going on, how technology is still changing the sport hopefully year after year it continues and meeting new fishing pals from British Columbia to the British Isles. Thanks to Kyle from Compleat Thought again for putting the Social Media section ie: -Bloggers area and it was also great meet some of the Top Fly Fishing News creators out there serving the blogosphere. Sad news to my local Colorado pals, the show was just moved to New Orleans for 2011! Man, just when I was enjoying having all the Top Fly Fishing shows in my backyard. What can you say, New Orleans needs it and I need another excuse to head South for Saltwater fishing and Partying in the Big Easy. Mark Lance- Mark is another friend of mine I've known for years and if you want one of the best guys all around for photography and fishing adventurers he's it. Where has this guy not been? Brian Okeefe watch your back, Mark is moving up in the industry and from his latest adventures in British Columbia chasing Steelhead, he's been off having fun again. Brian Grossenberger- I ran into Brian while chatting with Carter-- and when Brian came over to chat, I instantly realized that 1/2 of the magazines I read, he's had the covers. Brian is an incredible photograher that I had to apologize to after my Spring edition about top Photographers and I just listed a link and not a write up about. As promised wait and see, you're spot is coming! Checkout out Brian's page if you haven't, you won't be disappointed. Corey Kruitbosch & Brian Gregson- I had to connect with my friend Corey who made it to the show and I forgot to touch base before he got here. Luckily we were able to connect before he departed and to finally meet Brian as well. Two of the top newcomers (hate to say newcomers) in photography have to be Corey and Brian. In just the last 2 years these guys have been showing up everywhere from Fly Fishing company profile covers, magazine covers to Industry catalogs. Also they both play a big part in Utah Water Guardians keeping a close eye on our favorite waters of Utah and water rights within the region. Sam- What can I say my man, you know your stuff and I'm sold! Korkers has some incredibly new products out this year and from what I've seen the new Chrome and Metalhead models will be flying of the shelf's in no time. Crosby- A few of the guys that tagged along with me (FFA employees to get in) were buddies with Crosby, the Regional Manager for Hardy and it was nice to get some insight as to Hardy's new candy out next year! Their new rod SINTRIX is finally out so watch out! SINTRIX short for Silica Nano Matrix is a new formulation of resin that binds the carbon fiber and re-enforces the blank to such an extent that broken rods may be a thing of the past. Rods made with SINTRIX™ are effectively 60% stronger, up to 30% lighter and have hugely improved impact resistance over conventional carbon fiber. Try one out and I can guarantee you won't be disappointed, I know after talking to Tarpon Master Andy Mill about it I'm sold. Geoff- I finally got to catch up with Geoff, it's been months of chatting about our fish tales and trying to catch up to talk more about fish tales and Ross's latest in Reel Technology. 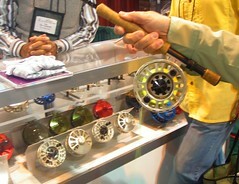 Great new F1 reel series and I can't wait to try one out this Fall. Ted Juracsik is back at it again making some of the best reels out there, is that something new, doubt it! With some of their new models out this year encountered a facelift you might like, I know being a huge Tibor fan myself . 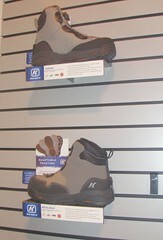 The new Tibor Signature Series models are out and on everyones hot list. I love their new quick change reels, teflon material and core drag makes this one of the top performers around. 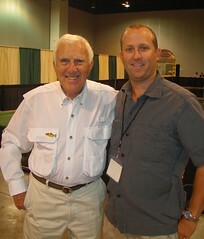 Carter Andrews- Carter is one good guy to chat fishing with. Whether it's his fishing shows in the past with Jose Wejebe on Spanish Fly, Madfin Shark Tournament, his newest venture in Isla Secas Panama or his addiction to Stillwater fishing -remember that Fly Fishing Magazine cover last year with a 12lb Monster brown, that was Carter. Definitely hitting him up in Wyoming for some bruisers and also can't wait to cancel my Costa Rica trip next year and meet you down in Panama for some fun. Travis Rummel-I bumped into Travis at the show and had to make an immediate gracious thanks you, thanks for making one sweet fly fishing video once again! Travis is part of Felt Soul Media and creator or the latest hit "Eastern Rises"
Jan Bach Kristensen-Jon your Tarpon video "Tapam" Video was voted #1 Drake Video awards...Wow is all I can say! Tarpon in a belly boat is something nobody does, nor crazy enough to try. Thanks for showcasing this Amazing video and sequence of Tarpon action on a float tube! Dave Whitlock-My new best friend from the show hands down! After spending some time with the Legend himself talking freshwater fishing and a few hotspots of mine, Dave asked for my information to call to go chase some Carp when he gets into Denver next time, my response.....uhhh sure Mr. Whitlock call me anytime you like. Vincent Su- It's time to get back out for some Stillwater again this Fall my friend Vincent talked about as I caught up a bit this weekend. Mr. 720 Vise seems to always be working or selling his very popular 710 vise model. We fish when we can but this Fall will be the time for some big fish in some hidden stillwater areas of ours. Ben Furimsky- What doesn't Ben do these days. Between help run the biggest fly fishing show in the country with his dad, busy tying some incredible patterns out on the market, busy guiding or keeping busy running one of the nest Angling Bookstores around? Well I can't wait to get back down to the Crested Buttes/Gunnison area this Fall a few times. He kept a few of us busy entertaining last Fall and hope to get back again soon for some fun. Bruning Rangel- Bruning is a buddy I've known for years and anyone seeking a fly fishing adventure in Middle to North Park he's your man. Oh did I mention he also has a hunting operation and top level bird dogs. Rick Takahashi- Rick was a busy man again this show and not much time to catch up but did swing by his booth to view some of his latest flies in demand. Can't wait to get back out on the water sometime and do some stillwater fishing. -whether Trout, Lakers or Pike he's caught em. Whether it's fishing with our pal Ryan Davey or fishing with all across the country or top fly tying he does it. We talked a few big upcoming trips this Fall and catching up to do some fishing in the future, would love to learn a few things from him about catching big trout. GMF- Okay I thought I knew a ton of people at the show till I ran into my pal GMF AKA-dave. Everywhere we went he was introducing me to people. Okay I introduced to a couple as well but he definitely knew who to talk with and who to payback for from his hangover the night before at the Drake Movie Awards night. Dream Stream is a calling us GMF! Others in Attendance that just not enough time to talk to dang it! Andy Mill -the Tarpon King and Saltwater master, Bob Clouser..he's the man and Brian Okeefe- what a crazy character and my idol for the lifestyle this guy leads. 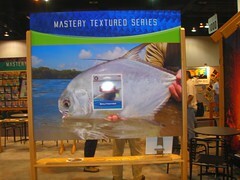 *Recap also from Midcurrent on the top product reviews and videos from the show. Great work Marshall.